Yes, you can grow ripe and juicy fresh Apricots right here in the UK!! They will provide a spectacular cloud of pink blossom in Spring, and juicy yellow Apricot fruits in Summer. 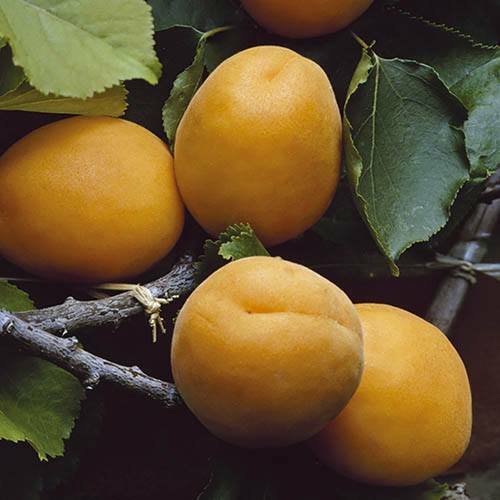 Apricot 'Aprigold' is the fabulous patio Apricot from the world-leading Zaiger American breeding program. Naturally very compact, and yet self-fertile, it makes the ideal patio fruit tree for large pots on sunny patios, balconies and gardens. With the added benefit of lovely soft-pink early blossom, it has a lovely spring feature too, and as the new leaves emerge they have a lovely orange-red tinge to them, classic of Apricots. Remaining below 1.2M for 10 years or so, this makes it an ideal fruit tree for smaller gardens. Apricots are early fruiters even in the UK, and once established in a year or 2, you should get good crops of tasty, juicy apricots from late July into August every year. Supplied as a patio tree 70cm-80cm tall, top grafted.